The c-stand gets its hyphenated name from the word "century", hinting that the stand has one hundred uses. 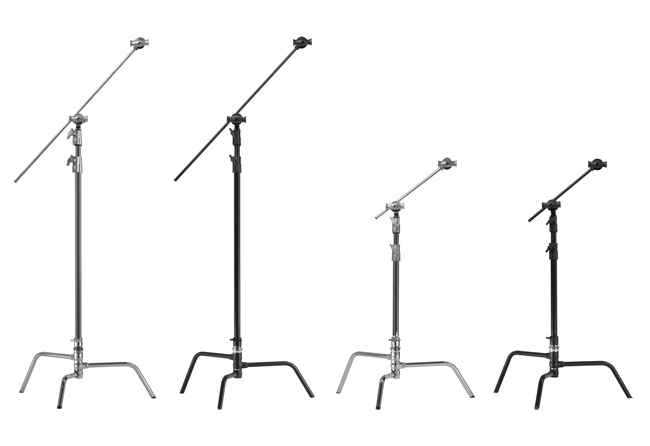 In the time test of the film industry at large, the c-stand has really proven to have far more that a hundred uses and configurations. It is the absolute standard in support stands across all variations of the film, video, TV and new media production realms. The c-stand is easily recognizable by the shape of it's three legs, especially when the legs are folded for storage and transport. The modern c-stand comes in two common lengths. The most popular overall length from the ground to the top of the 5/8" pin is 42". There is also a popular shorter version at 22" overall length that is lovingly referred to as the Gary Coleman (or Coleman) stand, named for the late actor who was actually of course quite a bit taller that 22 inches. As mentioned, the century stand has far more that one hundred configurations but here are a few of the most common.